All roads lead to Rome. The Eternal City is a special place that’s dear to my heart as it was the first European city I visited when I made my initial trip in 2000. I must say every return has led to new and exciting discoveries that have allowed for my continued personal and professional growth — this return was no exception. My travels and the people I meet are always life changing, as this was the case at Hotel Eden. This recommendation from a Palm Beach friend, whose tastes are aligned with mine, placed me in one of the most luxurious, intimate and peaceful boutique hotels I’ve experienced. Being the ultimate hunter of all things high-end, refined and rare, Hotel Eden not only fulfilled my expectations, they surpassed them with elegance and grace. Hotel Eden should be at the top of your “Roman Holiday” experience as plans are being made for your 2019 holiday. I personally invite you to allow yourself to indulge in what I can honestly say was one of the most welcoming and inviting stays. Before going any further, I MUST thank those who were so instrumental in making our time before, during and afterward at Hotel Eden a priceless and most cherished experience – – one that will be repeated again and again. So to: Stefano Alori, Relationship Manger, from your original email welcoming us and extending your team to our disposal which we found most help with respect to securing reservations within and outside of Hotel Eden. Francesca Margognoni, Reservations, your kind and detailed correspondences reassured us that all was in order and our arrival was anticipated, as well as securing the Junior Suite — a fantastic selection and view. Azzurra, Reservations, for securing our much needed dinner reservations and for always responding to our inquires – – you definitely enhanced our stay. Mr. Alessandro Arciola, Head Concierge, many thanks for taking amazing care of us. Your recommendations and inside knowledge of Rome as well as keeping our dinner reservation in order were priceless. Luca Virgilio, General Manager, your taking time to welcome us and to share insights about Hotel Eden were very much appreciated as we are making plans to return in September and look forward to another memorable stay. Bravi to the staff!!!! Rossella, many thanks for all your amazing help and for the heads up on the pastry in Lisbon, it was AMAZING. And Alessandro, again you are and was absolutely a lifesaver as your recommendations and knowledge of the Eternal City were invaluable. Hope you are ready for our return this September, 2019. I encourage a stay at Hotel Eden as our time with the staff, the beautiful and inviting hotel, the view and overall ambience was the perfect start and finish to a fantastic Roman Holiday in the Eternal City. 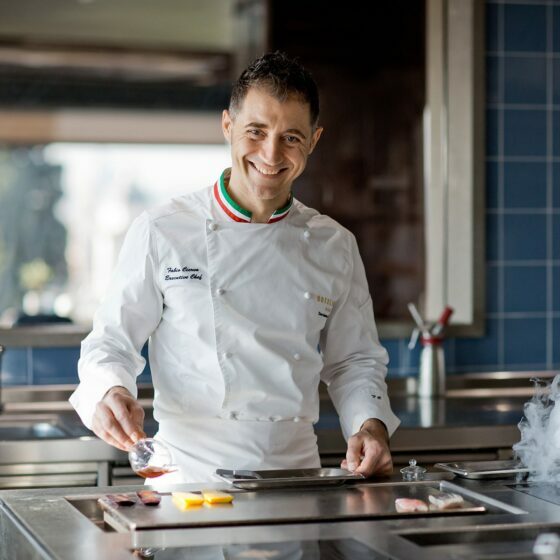 Aside from this most amazing experience, I must say one additional experience that absolutely took this encounter over the top was the time spent with Michelin-starred Chef Fabio Ciervo of La Terrazza. I’m forever indebted to him for personally taking the time to introduce me to his philosophy of food, which was transformative. This, for me was the ultimate mental, physical and spiritual union with food. Look for my upcoming post from La Terrazza with Chef Fabio.